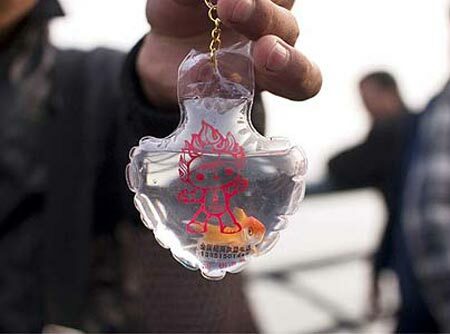 Sealed goldfish keychains using live goldfish are a popular novelty in Qingdao, China. If you think for a moment, you'd find this disturbing. Fish need oxygen; they get it from the water in which they swim. If you put them in a small, sealed environment, they exhaust the oxygen in the water relatively quickly. Then, they die. Apparently, it takes only a few hours for the fish to die once placed in the keychain fob. A similar custom was seen in Arthur C. Clarke's Imperial Earth, in the form of a unique kind of hat. A guest speaker, a resident of a colony on Titan, catches sight of this novel hat. "Either he had taken leave of his senses, which was an acceptable working hypothesis, or there was a live fish swimming around in the third row. It was orbiting in a tiny crystal globe, surrounded by a tasteful display of corals and seashells, on the head of an intense middle-aged lady who, unluckily, was staring straight at him with popeyed concentration. The smallest member of the audience was showing obvious signs of distress... swimming round and round at an acute angle to the rest of the world.... Should he stop talking, and warn Miss Fishbowl of the impending tragedy of which she was obviously unaware?... Alas, it was too late. With a final convulsive wriggle, the fish turned belly up and floated motionless in its crystal globe." Clarke uses this as a way to emphasize the difference between a space colonist, who lives in a sealed environment the oxygen for which must be constantly renewed, and oblivious Earthlings, who live on a planet that endlessly provides free oxygen without machinery. Via Gizmodo; thanks to Erik for pointing this item out, and providing the quote.